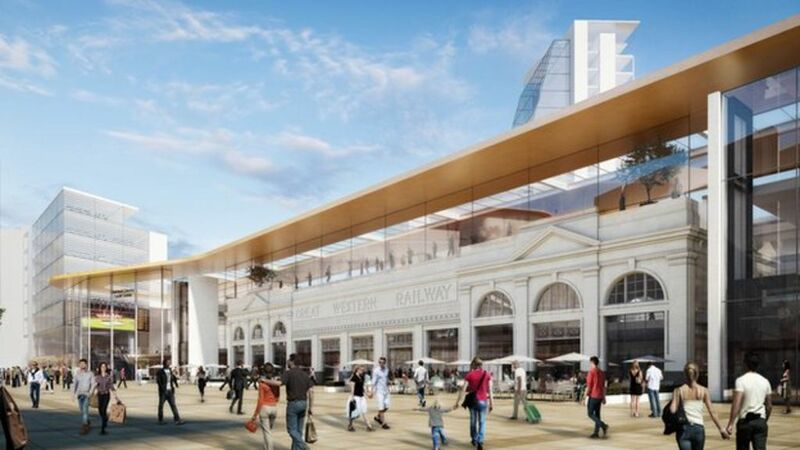 Fresh plans have been drawn up for the biggest transformation of Cardiff Central railway station since it was built in the 1850s. Last year, Network Rail released images which included a wave effect roof which but this has now been stripped back to a more standard glass fronted entrance. There would also be new retail space and a mezzanine floor. The work coincides with plans to revamp that area of the city centre which is where the new BBC building will be. A new bus terminal is also being built in the area. The earliest work on the station could start would be 2019 but Network Rail have yet to fully cost the multi-million pound plans. Other works at the station are being carried out including a new south entrance. Currently, 13 million people use Cardiff Central per year and that figure is expected to grow to 23 million by 2023. Fresh plans are drawn up for the biggest transformation of Cardiff Central railway station since it was built in the 1850s. The impressive art deco lights in the foyer of Cardiff Central on 6 March 2015. Grab shot from a Barry Island service departing from Cardiff Central on 30 October, showing refurbished DB Schenker 60024 heading slowly east through the station with a heavy consist of steel slab. Peak (class 45) no 89 Honourable Artillery Company at Cardiff General (renamed Cardiff Central in May 1973) shortly after arrival on train 1V61, the 07.08 Derby - Cardiff, on Saturday 14th March 1970.